In The Works is be presented monthly and feature three composers or composer teams, each presenting about 20 minutes of new material. 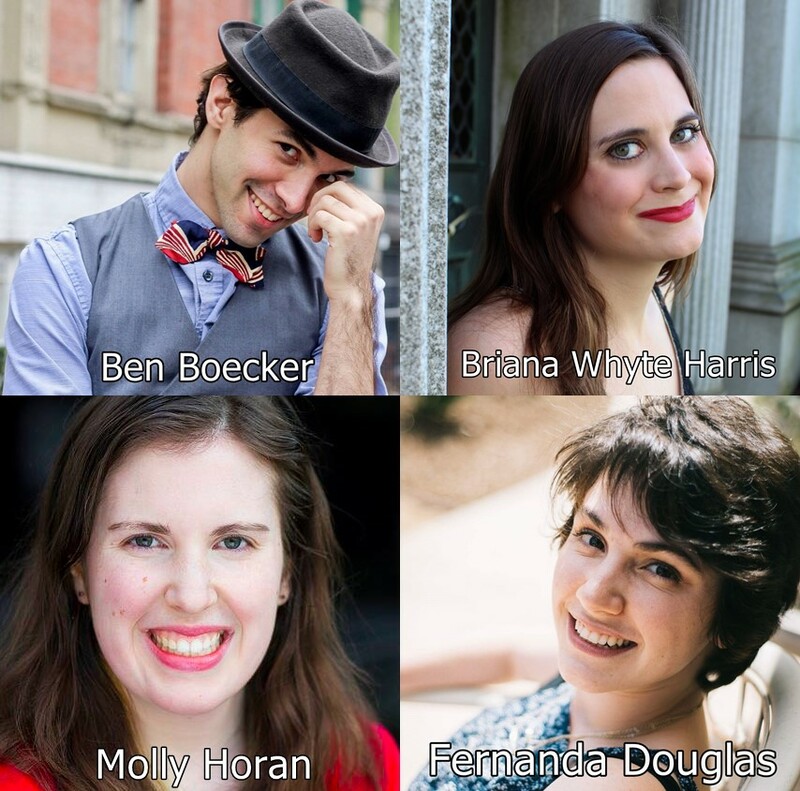 This month features the works of composers: Ben Boecker, Briana Whyte Harris, and Molly Horan & Fernanda Douglas. Hosted by: Thomas Honeck. BRIANA WHYTE HARRIS is a Brooklyn-based librettist/lyricist/composer. She is the creator of the webseries Princess the Cat and co-writer for the webseries MunchCo Calling! Her sketch comedy has been performed at Upright Citizens Brigade, and she has also performed stand-up at Caroline’s. Her most recent production was Savoy! Dancing Through The Swing Era, an interactive, community-based dance revue that was last performed in Queens in November 2018. She is a member of the BMI Librettists Workshop and a student of the NYU Tisch Graduate Musical Theatre Writing Program, class of 2019. She also dances with the Brooklyn BombShells, the winning-est group in the history of the Coney Island Mermaid Parade. MOLLY HORAN is an adjunct professor focusing on children’s and young adult literature and writing for the web at SVA, NYU, and Fordham. A member of the BMI musical theater workshop, her plays have been performed at The People’s Improv Theater, Arizona University, and as a part of Stage Q’s Queer Shorts program. FERNANDA DOUGLAS is a composer and music director from Goleta, California, and a graduate of Columbia University. She is an active member of the BMI Musical Theatre Workshop and her original musical, Plath., was part of the 2015 NY Fringe Festival. Fernanda is an associate voice coach with Broadway vocal supervisor, Liz Caplan, and in her free time, she’s the deputy director of The Dream Unfinished, the NYC-based activist orchestra. She recently returned from New Delhi, India where she was working on the musical adaptation of film director, Mira Nair’s Monsoon Wedding.